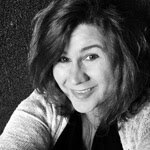 Man Food is the theme for this week's #SundaySupper event hosted by Susan, The Girl in the Little Red Kitchen, and I knew immediately I would be doing something with short ribs. What can I say? I had a craving!! Have I mentioned how much I love, love, love short ribs?! It really doesn't get much better than Beef Short Ribs whether you are making Man Food or not! Short Ribs are da bomb! These babies practically cook themselves to perfection, always melt in your mouth, and are so amazingly flavorful. 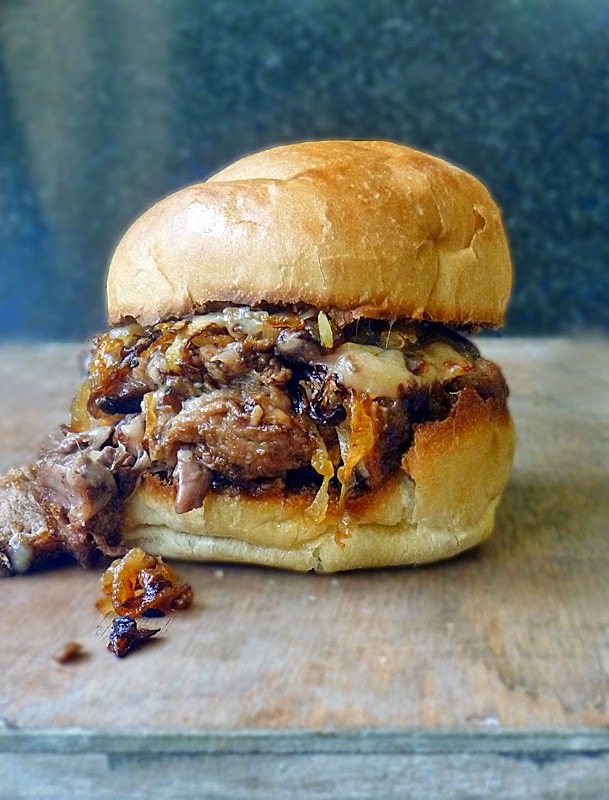 You can serve these short ribs many ways, but I made them in sandwich form because, honestly, what man can resist a toasty bun piled high with tender, juicy beef, oodles of caramelized onions and melty cheese? I can't think of one! Did I mention these sandwiches are braised in a stout beer sauce? Yep! It gives the beef a deep, rich flavor that intensifies with age, so you can make the short ribs a day ahead and your sandwiches will taste even better! Perfection! Happy Father's Day to all the wonderful dads and to the single moms who sometimes have to take on the role of dad. I hope you have a truly wonderful day enjoying your children. When Madison was younger we used to have a tradition where we would go out to breakfast with the whole family on Father's Day. One year Madison made a crown for Don for Father's Day. We carefully measured his head with string while he was sleeping <grin>, and I helped her cut out a crown shape from cardboard. She painted it yellow and glued on some shiny gems, and even glued on some cotton balls for fur trim! We went all out on this crown y'all! I was so happy to find this picture and share it with you! Man, I love these two!! Don, being the amazing father he is, proudly wore that crown out to breakfast and never took it off! We got lots of looks, but the only one that mattered was the look of happiness on Madison's face. That kid was beaming!! 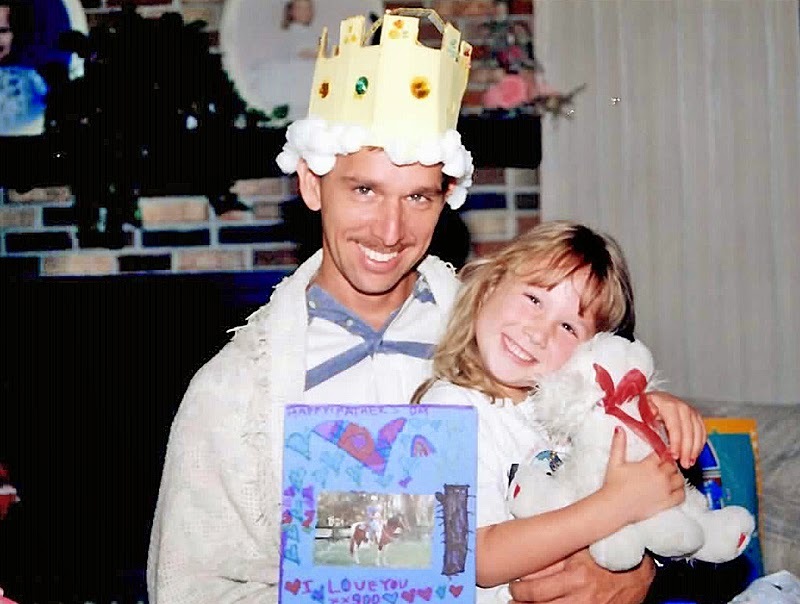 and Don wore that crown for many years every Father's Day. Madison hit the jackpot with such a great dad! Happy Father's Day hon! We love you! Season the short ribs with 2 teaspoons kosher salt and 1 teaspoon ground black pepper. Dredge the seasoned ribs in the flour until lightly coated, shaking off excess. Heat a dutch oven over mid-high heat and add 1 tablespoon olive oil and 1 tablespoon butter. Allow the fat to heat up just a bit, but don't burn it. Then add the ribs in a single layer and brown on all sides. You might not be able to fit all of them into the pan at once. That's okay. Brown what you can on all sides and then remove the browned ribs and set aside until all ribs are nicely browned on all sides. This will take 4-5 minutes on each side to brown, but it is worth it. The browning definitely adds flavor. When all the ribs are browned, remove them from the pan and set aside. Reduce the heat to medium, and add the sliced onion and 1 tablespoon freshly minced garlic to the pan. Cook, stirring, for about minute and then pour in the can of beer. Stir, being sure to scrape all the browned bits from the bottom of the pan. Add 1 teaspoon beef base to 1 cup hot water and stir to combine. Pour the beef base mixture into the pan and stir, bringing to a gentle boil. Return the beef short ribs to the pan, cover and reduce heat. Allow the ribs to simmer until very tender - about 2 hours. 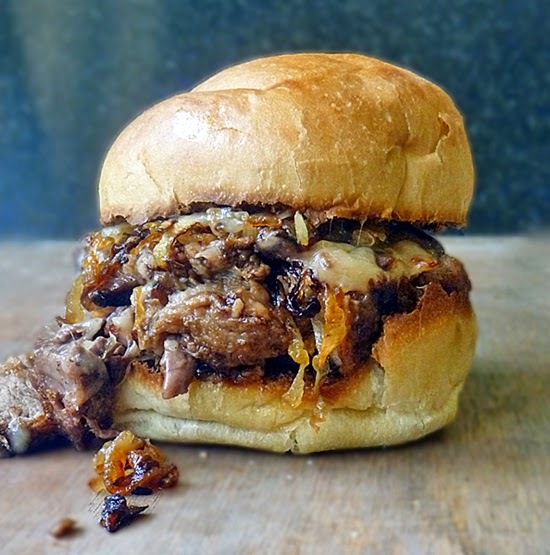 If you'll be eating your short ribs sandwiches the same day, go ahead and start your caramelized onions. Heat a skillet over medium heat and melt 2 tablespoons butter. Add the sliced onions and a pinch of salt and stir, cooking, until they are tender. Reduce the heat to mid-low and continue to cook until the onions are a nice caramel color, stirring occasionally. This will take about 30-45 minutes depending on how high your heat is. I like to caramelize onions over a mid-low heat nice and slow. Once they are just the way you like them, give them a taste and add salt and pepper to your liking. Set aside. When the short ribs are fall-off-the-bone tender, go ahead and remove the bones and discard. You can store the beef in the sauce overnight and the flavors will intensify, but if you can't wait divide the beef among the four toasted buns and top with a spoonful of the sauce in which the ribs cooked. Then top with caramelized onions and a slice of Fontina Cheese. Pop the sandwich back under the broiler to melt the cheese and enjoy! Total time: 2 hrs. 30 mins. This is my first time participating in a #SundaySupper event, and I couldn't be more excited about it. As a family, we have always made eating dinner together at the table a priority. Even now, with Madison off at college, Don and I still sit down together at the table and enjoy our meal. Be on the look out for more of these #SundaySupper events, as I am looking forward to being a proud supporter of this movement! Garlic and Herb Wine Jelly by What Smells So Good? Meatball Burger on Garlic Bread by Healthy.Delicious. Beer Funnel Cake by Killer Bunnies, Inc.
Join the #SundaySupper conversation on twitter on Sunday! We tweet throughout the day and share recipes from all over the world. Our weekly chat starts at 7:00 pm ET. Follow the #SundaySupper hashtag and remember to include it in your tweets to join in the chat. Check out our #SundaySupper Pinterest board for more fabulous recipes and food photos. Would you like to join the Sunday Supper Movement? It’s easy! You can sign up by clicking here: Sunday Supper Movement. How sweet is the crown story? I love that he never took it off :) In other news, this sandwich looks ah-mazing! Awww! That is so sweet! I love the photo of your husband and daughter. That is priceless! 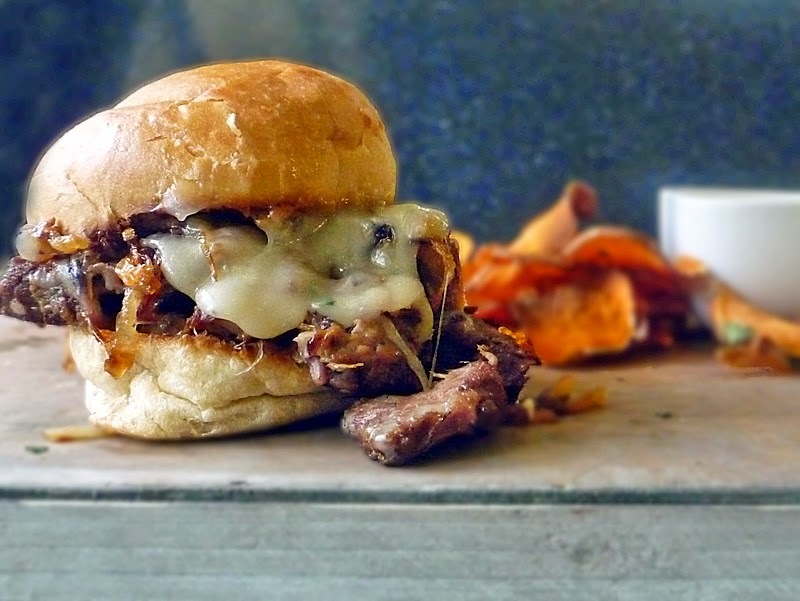 And that short rib sandwich looks AHHH-MAZ-ING! I have to try that. Thanks for sharing! Have a wonderful Father's Day Don! Wow, where has this marvelous sandwich been all my life?? Truly man food, but this gal would like some, too!!! Aren't dad's incredible. My husband walked all the way home with my daughter's sun hat on because she wanted him to wear it. This sandwich looks like a great way to say thank you for being awesome. Awwwww...that's awesome! They really are the best :). thanks for stopping by Laura! This sounds great! Definitely qualifies as man food in this guy's opinion. I love the crown and I love that Don wore it all day! Awe. What a great story and a delicious looking recipe too! Drool, drool, drool, great Manwich!!! haha don't short you 'puter ;) !! Thanks for stopping by, Tara!! that makes two of us! Thanks for stopping by, Sarah! These look amazing! I saw them on Google+, and shared them on Facebook. Can't wait to try these! Haha maybe she should put that on her resume ;) Thank you, Shaina! I love the crown story! What a sweetie. And this short rib sandwich looks absolutely amazing! Pinning it for my family right now! Short ribs, fontina, stout AND caramelized onions?!? This sandwich has all of the good things. Love it! I couldn't agree more, Lori!! Thanks for stopping by! Short ribs, fontina and caramelized onions are beyond a favorite of mine. Who cares if the dad's want it…I DO!! Haha Me too!!! Thanks for stopping by Betsy! I adore that photo! What a great memory! That there is a real dad. And that there is a real sandwich! I'd definitely scarf it down in a heartbeat. The crown is priceless and this burger sounds divine! Love it. It is such a good memory! Thanks for stopping by Sherron! That looks like one incredible sandwich! I love short ribs and I totally just drooled all over my key board! What an amazing sandwich! I was admiring that sandwich and drooling a little (ok, a lot) but then I teared up after reading that Don wore your daughter's crown all through breakfast. That's true love. My dad would immediately throw away all the stuff I made him when I was a kid. Let me comfort myself by imagining myself eating your incredible short rib sammich. Toasty bun, caramelized onions, fontina cheese and a stout braise?! Yes to all of it! I tear up too. It is such a good memory, and she is a lucky girl to have such a great dad. Thanks for stopping by!! Yes, this is a drool-worthy sandwich. What a lucky guy that sat down in front of this dish. I keep telling him how lucky he is haha! Thanks for stopping by Alaiyo! I really enjoy ribs but would rather not deal with the bone. PERFECT! The bone can make a handy stick somethings, but with short ribs it usually just falls right off anyway haha! Thanks for stopping by Danielle! This sandwich looks SO flippin' good!!! Plus, I love the crown and that he wore it all during breakfast. What a great dad! Love the crown for the king of the day! I'd say Madison was blessed with two terrific parents...And doubly blessed that one of them can produce mouthwatering fare like this short rib sandwich! Oh yes, short ribs are da bomb! What an awesome sandwich for the guys and us gals too. Oh good gracious that looks good! I almost licked the screen!!! Thank you for stopping by to let me know, Stacy! This comment makes my whole day! I am so happy you love it :) Have a super week!! Can this be done in a slow cooker? Hi Robert, yes, this can be done in the slow cooker. I recommend browning the ribs as directed and then place in slow cooker. Mix up the sauce in the same pan you browned the ribs, scraping up the browned bits and then pour it into the slow cooker with the ribs. Cook on low about 5 hours until the ribs are tender. Cook the caramelized onions in a skillet as directed. I hope that helps. Omg this looks amazing! Our daughter will be home for the weekend to help make this fantastic recipe...will send dets later! Had this sandwich for dinner tonight. I was a bit nervous because I tasted the "broth" after I had stirred everything together, and it wasn't so good. BUT...I put everything in my slow cooker, turned it to "low," and about five hours later...VOILA! This was scrumptious straight from the pot, even more so on toasted buttered rolls with Fontina. I served with a side of homemade cole slaw and quick fried sweet potato slices. YUM-O! Thank you for sharing! Your website is very messy. I am looking for the California Club recipe and it is nowhere to be found despite where you tell me to look. I am very disappointed in your website. This sandwich looks amazing! I just had one question: what size are the short ribs when you're browning them in the beginning? That is, are they already sliced thickly before you're starting to cook, or do you slice them just before assembling the sandwich, or at some point in between? Thanks!